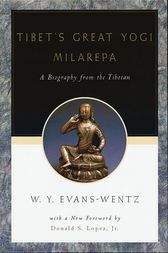 This life story of Milarepa--the important Tibetan religious leader who lived over 800 years ago--is part of a remarkable four-volume series on Tibetan Buddhism produced by the late W.Y. Evans-Wentz, all four of which are being published by Oxford in new editions. While there are many parochial differences among the several sects of Tibetan Buddhism, each holds the Great Yogi Milarepa in the highest reverence and esteem. For exemplified in Milarepa's life, as we discover in these pages, are all of the teachings of the great yogis of India--including those of Gautama the Buddha, the greatest yogi known to history.Amid his detailed introductory and explanatory notes for this text, Evans-Wentz also reveals compelling similarities between the life and thought of Milarepa and those of Jesus, Gandhi, and "saints...in ancient China, or India, or Babylonia, or Egypt, or Rome, or in our own epoch." In composing this translation from the original Tibetan, the late L=ama Kazi Dawa-Samdup, who was Evans-Wentz's guru for many years, aimed to show Western readers "one of our great teachers as he actually lived...much of which is couched in the words of his own mouth, and the remainder in the words of his disciple Rechung, who knew him in the flesh." For this third edition, Donald S. Lopez, author of Prisoners of Shangri-La: Tibetan Buddhism and the West, has written a critical foreword that updates and contextualizes this crucial part of Evans-Wentz's scholarship within the yoga tradition.